In summer 2006, about 800 ancient archaeological objects were wrapped, boxed and gently transferred from the Rose Art Museum to the Classical Artifact Research Collection (CLARC) in Rabb to allow students to study art and history experientially by identifying and tracing the origins and earlier expeditions of these unique and fragile artifacts. Dr. James Rush of Clearwater, Florida made a generous gift to install a state-of-the-art security system to protect the collection. The office of then-Provost Marty Wyngaarden Krauss generously secured and helped fund the establishment of our new home for these objects, including marble and bronze figurines, ceramics, weapons, jewelry and medical instruments from 1500 B.C.E. to the Byzantine period. These objects, mostly gifts to the university, were gathered into the current collection more than 20 years ago under the curatorship of classical studies. An additional gift from Dr. James Sussman expanded the collection impressively. Regarding the collection itself, Director Ann Olga Koloski-Ostrow calls it astonishing, saying, "The students' amazement at the artifacts is palpable. We hope it will captivate and inspire our students and archaeological scholars for years to come." In fall 2006, the department began a formal internship program for three undergraduates each academic year. 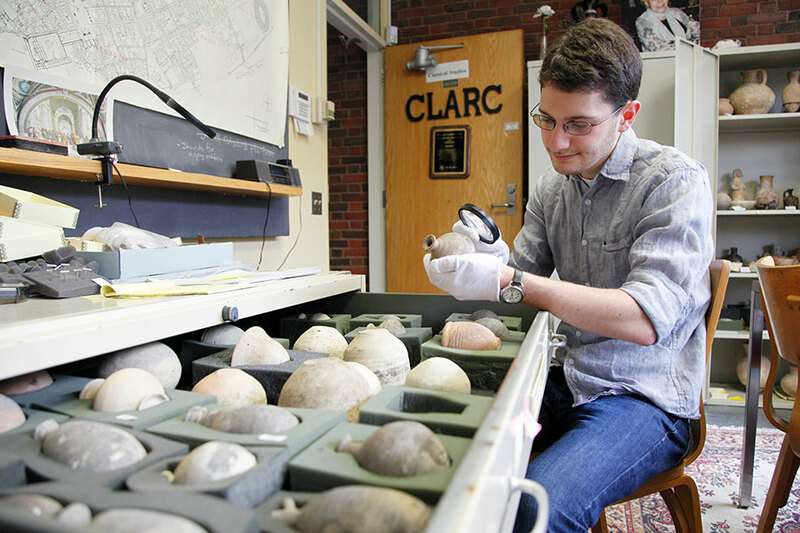 The internship comprises a year-long class, as interns work with, research and document the ancient artifacts in CLARC. Terms of the program require that interns must be a classical studies major and that they be able to meet during the fall and spring semesters four hours each week for a total of 100 hours. The course (92a/b) earns two credit units per semester. Each spring semester, competition for the three slots is fierce, with new interns announced at the end of April. Over the course of the next academic year, interns meet weekly at the CLARC center with classical studies archaeologist Ann Olga Koloski-Ostrow. For more general information about internships, visit the Hiatt Career Center website. Professor Cheryl Walker, the faculty contact for internships, is also available for consultation. Selected Eunice M. Lebowitz Cohen Fellows may also be eligible to work in the center. Applications and complete information about the fellowship program are available on our Research Fellows page. In September 2006, the center received a generous gift of artifacts from Brandeis biologists Raquel and Maurice Sussman (he was formerly Goldman Professor of Biology at Brandeis). 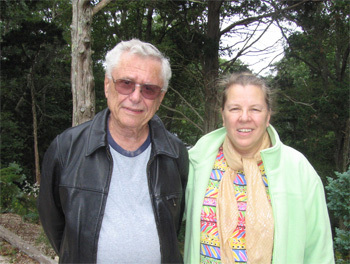 Professor Ann Olga Koloski-Ostrow met Maurice Sussman in Falmouth, Mass., prior to transporting the Sussman collection of artifacts back to CLARC. The collection of 24 ancient artifacts consists of bowls, pitchers, cups, and perfume and oil vials that range in age from middle Bronze Age (2,000 B.C.E.) to the late Roman period (500 C.E.). Collected while the Sussmans lived in Israel from 1973-76, the objects have enriched our increasingly important teaching collection of artifacts. We are immensely grateful to them for their generosity. After the competition for the three slots is announced in the spring, stop by Pod 227 in Mandel to receive an application.